The reasons why people go the hairdresser are various and complex – but this week Jane Sidell, Inspector of Ancient Monuments, and I visited a salon in the City of London for a purpose quite beyond the usual. 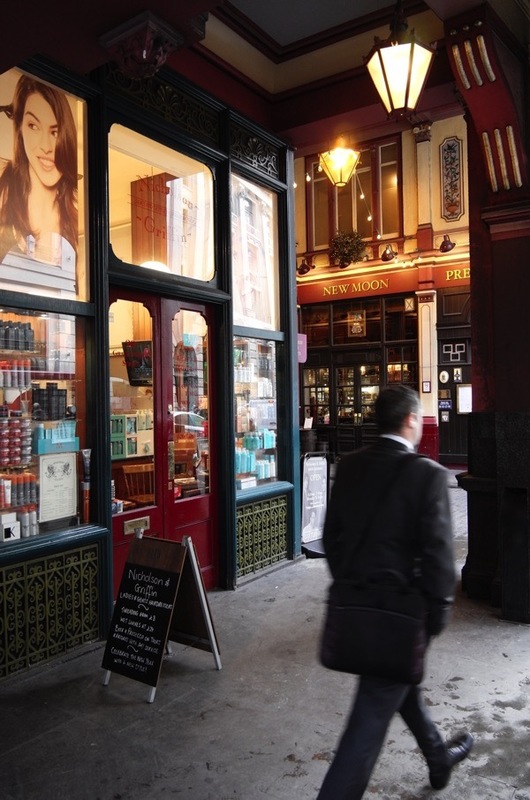 There is a hairdresser in Gracechurch St at the entrance to Leadenhall Market that is like no other. It appears unremarkable until you step through the tiny salon with room only for one customer and descend the staircase to find yourself in an enormous basement lined with mirrors and chairs, where busy hairdressers tend their clients’ coiffure. At the far corner of this chamber, there is a discreet glass door which leads to another space entirely. Upon first sight, there is undefined darkness on the other side of the door, as if it opened upon the infinite universe of space and time. 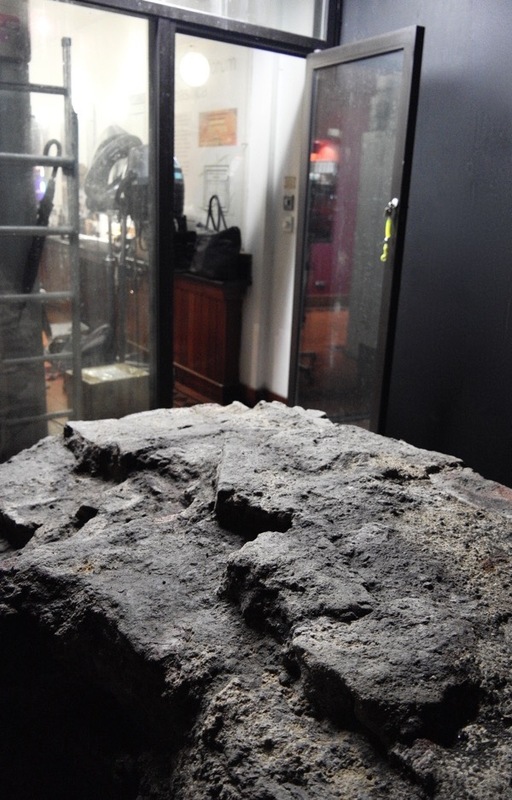 At the centre, sits an ancient structure of stone and brick. 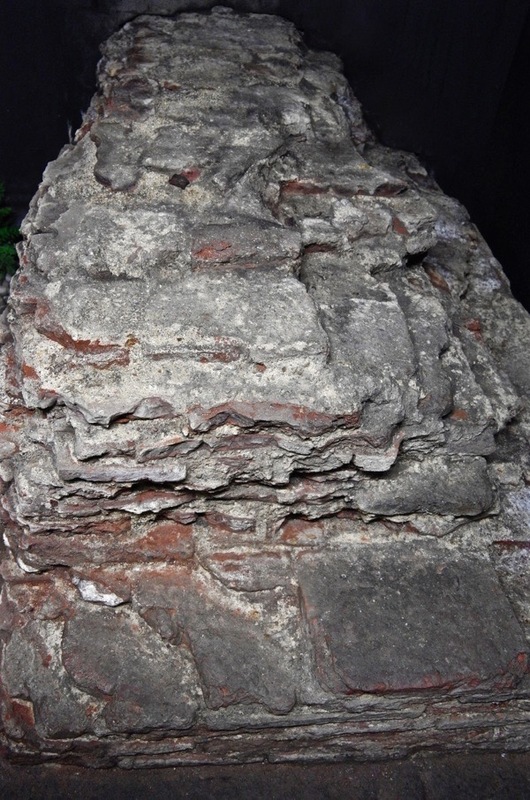 You are standing at ground level of Roman London and purpose of the visit is to inspect this fragmentary ruin of the basilica and forum built here in the first century and uncovered in 1881. Once the largest building in Europe north of the Alps, the structure originally extended as far west as Cornhill, as far north as Leadenhall St, as far east as Lime St and as far south as Lombard St. The basilica was the location of judicial and financial administration while the forum served as a public meeting place and market. 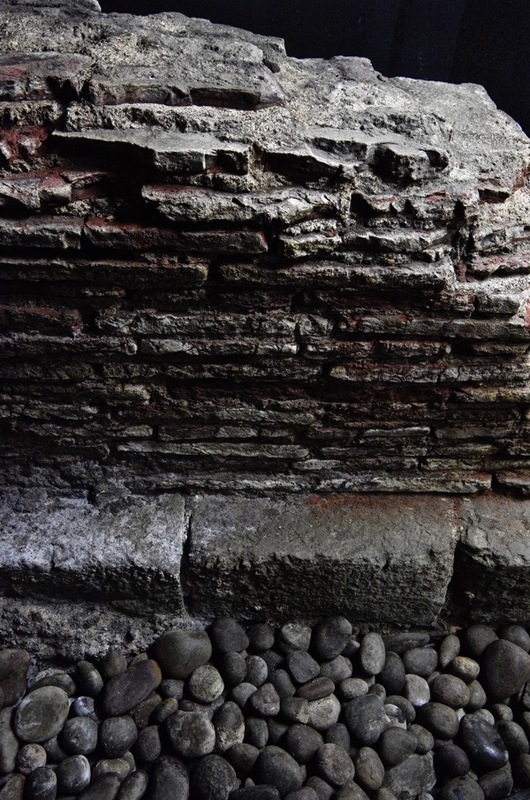 With astonishing continuity, two millennia later, the Roman ruins lie beneath Leadenhall Market and the surrounding offices of today’s legal and financial industries. 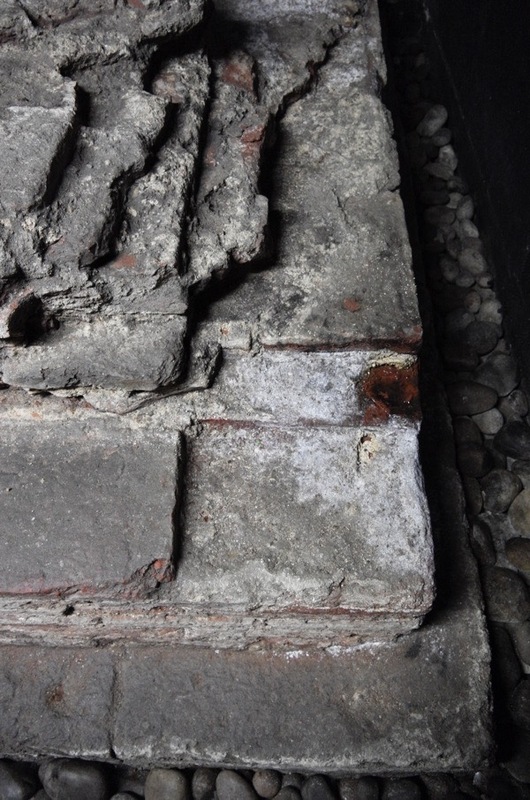 In the dark vault beneath the salon, you confront a neatly-constructed piece of wall consisting of fifteen courses of locally-made square clay bricks sitting upon a footing of shaped sandstone. 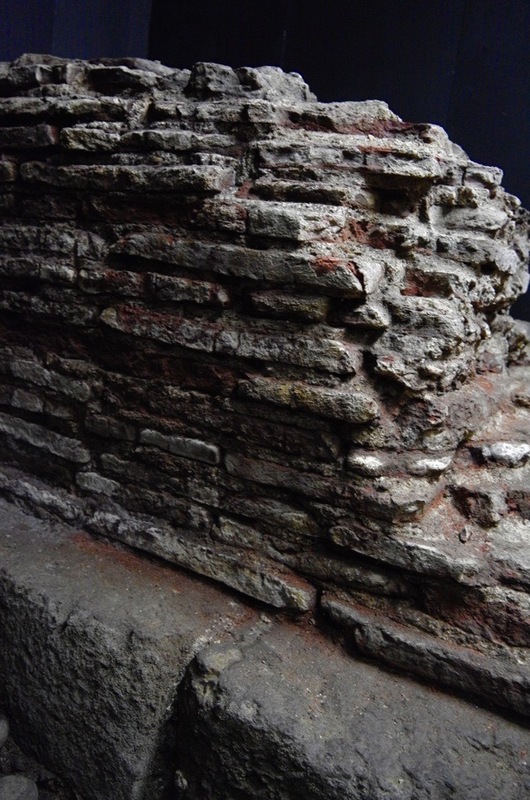 Clay bricks were commonly included to mark string courses, such as you may find in the Roman City wall but this usage as an architectural feature is unusual, suggesting it is a piece of design rather than mere utility. 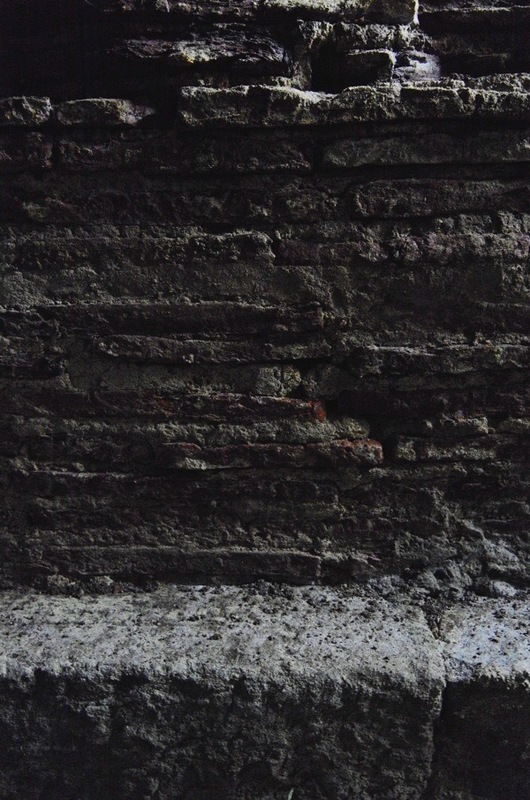 Once upon a time, countless people walked from the forum into the basilica and noticed this layer of bricks at the base of the wall which eventually became so familiar as to be invisible. They did not expect anyone in future to gaze in awe at this fragment from the deep recess of the past, any more than we might imagine a random section of the city of our own time being scrutinised by those yet to come, when we have long departed and London has been erased. Yet there will have been hairdressers in the Roman forum and this essential human requirement is unlikely ever to be redundant, which left me wondering if, in this instance, the continuum of history resides in the human activity in the salon as much as in the ruin beneath it. Totally random ruin but it’s a great find to seen. Cannot think why I did not comment on this before, as living in Britain’s first city, Colchester, we are surrounded by Roman remains everywhere and we never cease to try to imagine what life would have been like for them. Where I live would have been the ideal site for a roman villa as my house is as high as you can get to the north of the town and is on a south facing slope overlooking the river Colne and the town, I would think that any roman would immediately have seen the advantage of living here. No doubt any record of such a villa would have been obliterated years ago as the land had been farmed for generations before we came here but we have picked up roman artefacts on land nearby. and my son found pieces of tile when he dug out the foundations for my shed. I like to think of a Roman family living here and hope that they escaped the terror of the Boudiccan massacre. I am not a fan of Boudicca!! Apart from the Viscountess of course. Colchester was, of course, of much greater importance than London at first and we have recently discovered the most impressive roman circus anywhere in Europe which means that hundreds if not thousands of people would have travelled many miles to attend the games here, and pieces of a roman board game were discovered in a fairly recent excavation which a friend has researched enough to come up with a modern version which, thanks to him, you can have a go at playing at events in Colchester. I gather it somewhat resembles chess so you probably need to be quite good at maths and logic. I shall have to do a bit of research to see if we have discovered any hairdressing artefacts, I bet we have got some somewhere. 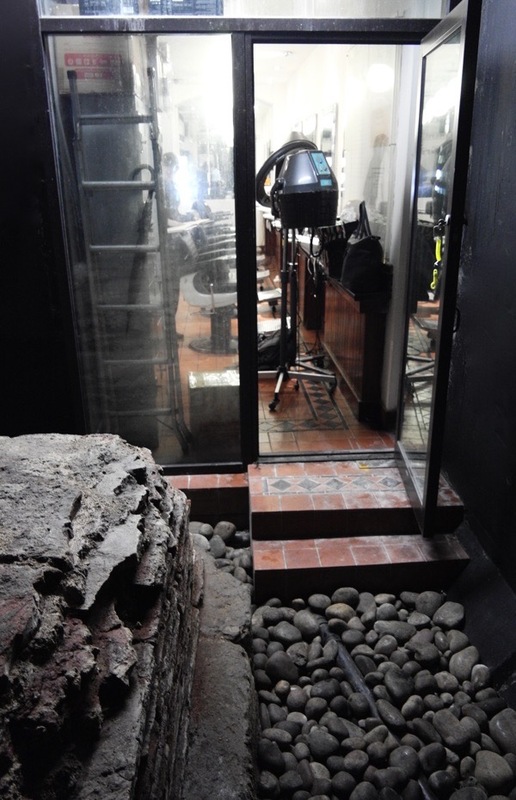 At the moment my son is searching for a well near us at our shop in the town centre as it could be that we have the first roman basilica in Colchester, the remains of a building that would fit a basilica have been found in the town centre and a well at the eastern end would be more proof. All of this is work in progress and I only mention it to prove how proud we are of Colchester’s history which is often overlooked in favour of London. Not only do we have the circus but we have the best preserved roman gateway at Balkerne Gate, most of the wall (built after Boudicca’s destruction of the town), the foundations of the Temple of Claudius and its surrounding colonnade, a theatre, a street plan on the roman grid system, and the many, many finds which can now be seen in our Castle Museum, plus of course the wonderful mosaics one of which can now be seen in the Firstsite Art Gallery. London is great but the first romans on these shores settled in Colchester and it was, and still is, Britain’s First City! How wonderful that such remains have survived. This is one of my favourites of your bulletins – and I enjoy and read them every day! Thank you very much!